I first started playing Double Deck Pinochle when I began implementing it for World of Card Games, about 6 months ago. So I have not been playing long. This page is a beginner's perspective. 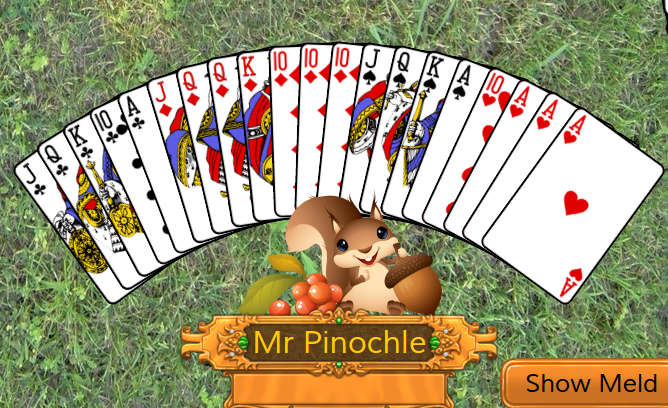 Pinochle contains some elements from several other card games at World of Card Games. It has the concept of "melds", special combinations of cards, as in Gin Rummy. However, the melds are more complex. For example, a "pinochle" meld, worth 4 points, is composed of the Jack of Diamonds and the Queen of Spades. There's nothing like that in Gin Rummy! You also have melds such as "Aces around" - an Ace in every suit. This is very similar to a Gin Rummy meld, although in Gin Rummy, a meld may contain just three Aces. There's a "trump suit", and a trick-taking phase, just like in Spades. In Euchre and 29, the trump suit is chosen by a player after the cards are dealt. It's the same for Pinochle. In Pinochle, there's an auction phase in which players "bid" for the privilege of choosing the trump suit. The bid is a number, 50 at a minimum. The player who bids highest gets to choose trump, but at a cost: they oblige their team to score the number of points bid, during that hand. This is very similar to the bidding in 29. In contrast, with Spades, your bid is a guess at the number of tricks you will take, and does not affect the trump suit, which is always Spades. My initial impression of Pinochle was heavily colored by playing a lot of Spades, a game which has only a few restrictions on what cards can be played when "following" a lead card. 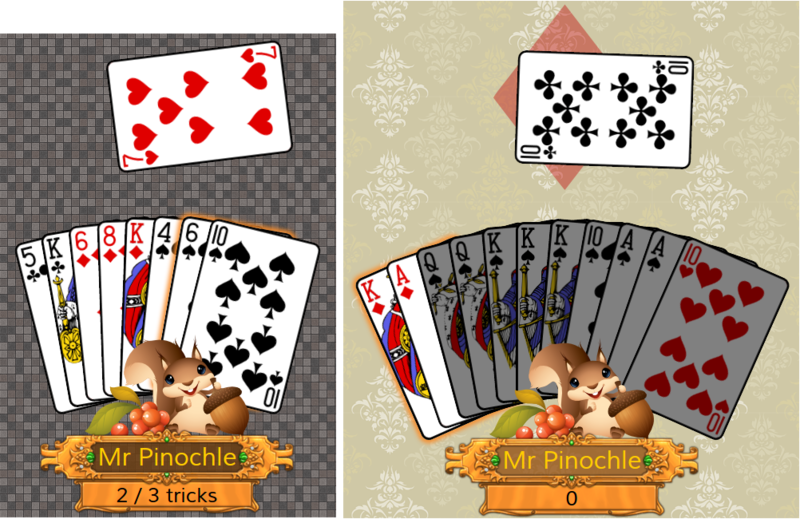 In the screenshots above, the player on the left is playing a game of Spades. Since he has no Hearts cards, he can follow with any other card. The player on the right is playing Pinochle. He has no Clubs cards, so he cannot follow the trick suit. Therefore, he must play a Diamond (trump) card. For someone used to Spades, being more restricted in your choice of cards can be frustrating. Just remember that everyone is equally affected by the rules, though. "Table talk" is considered questionable in most other games. However, in Pinochle, it is perfectly acceptable to use your bid to signal information about the "meld" in your hand to your partner. The more information you have about your partner's hand, the better prepared you are to make your own bid. As a very simple example, suppose you have two Pinochles in your hand. A Pinochle is a "meld" made up of a Queen of Spades and Jack of Diamonds. Two Pinochle melds are worth 30 points, not bad! Wouldn't it be nice if you could just tell your partner "I've got 2 Pinochles"? Suppose they had 30 meld points in their hand too... They could make a bid of 60 and feel comfortable knowing that between the two of you, you have enough meld to fulfill your bid. You cannot tell your partner verbally how many meld points you have, but you can signal it by choosing your bid carefully. In this case, you will want to bid 3 extra points over the previous player's bid - the 3 extra points means "I have 30 meld points". Pinochle experts will have worked out a very precise bidding system with their partners over the course of time. I recommend the bidding system described at Pagat's Double Deck Pinochle page for you to start with. It is relatively simple, and follows the example give above. Think before providing a "meld bid", however. If your partner has already passed (declined to bid), then there is no point in sharing any information about your meld points with the table. You are on your own in figuring out what to bid. Your partner may have no meld points at all, or just a few points. Also, if you have no Marriage melds, it is probably unwise to bid at all. In that case, if you win the bid, you will be unable to choose a trump. The rule is that you can only choose trump from a suit in which you have Marriage melds. So your team would get your bid subtracted from your score, an unpleasant penalty. When I first began playing Pinochle, I was overwhelmed by all the different types of meld, and the rules for when my cards could "overlap" to belong to several different melds, and when they could not. If you look carefully, you will see that the hand contains a "Run" in Clubs: A, 10, K, Q, J. Note: you will only get meld points for this Run if Clubs is the trump suit! You might also think that if Clubs is trump, you could get a Royal Marriage from the Q and K of Clubs. But that is not the case: Marriages and Runs are both "Type I" melds, and the same card cannot be applied to two different melds of the same type! If you hunt some more, you will spot a "Pinochle" meld in the hand: the Jack of Diamonds and Queen of Spades. That single Queen can also form a Spades Marriage together with the King of Spades. This is true because "Pinochle" melds are "Type II" melds, while Marriage melds are "Type I". Using the Queen in both melds is allowed. Using the "Show Meld" button picks out all the cards involved in melds that do not require a trump suit. It is left to you to look for the melds that do require a trump suit: "Runs" (A-10-K-Q-J of the trump suit) and "Royal Marriages" (K-Q of the trump suit). Since Marriages are all shown, you really only need to keep an eye out for Runs, and those become fairly obvious after practice. At this point, you may be wondering what to bid for the above hand of cards. Well, it depends. If my partner were the dealer and no one else had bid yet, I'd probably place a 50 bid, the lowest. This would save my partner from being forced to choose trump with poor cards, or even having to forfeit if they had no Marriages. Otherwise, I would probably pass. The hand has a total of 10 meld points, or 25 if I assume that Clubs is trump (15 points for the Run). If Clubs are chosen for trump, though, my hand would not be strong in trump. It seems like a risky hand for bidding, although it might work (remember I'm no expert!). If someone else had already bid, I would probably pass. I have 10 meld in my hand that do not depend on the trump suit. If I bid 1 more than the previous player, it does not indicate 10 meld - it indicates a desire to call the trump suit. I would probably not want to do this. And I can't bid 2 to signal my partner that I have 20 meld, since I only have 10 meld. I can't count the 15 meld from the Run because I do not know if my partner is planning on calling Clubs as trump. When signalling your meld points to your partner, you should not include points due to Runs or Royal Marriages! I'd love to hear from long-time Pinochle players about how they'd bid this hand! Bidding well is a crucial skill in Double Deck Pinochle... It is so important that it is used to decide the winner in certain cases when the score is not sufficient to do so. Normally, a victory is given to the team who crosses the "finish line" first, by taking 500 points or more in total. However, it can occasionally happen that both teams reach 500 points or more at the end of a hand. Then how can we interpret the rule that the winner is the team who gets 500 points first? This is where the "Bidder Out" rule is applied. If both teams reach 500 points or more in the same hand, then the victory is given to the team who declared trump. This is not necessarily the same as the team who got the highest score! If this happens when you are playing a game of Pinochle at World of Card Games, you will see a brief explanation at the "Game Over" page which reads "Bidder out rule awards win to high-bidding team when both teams score over 499". Pinochle is played with the "Bidder Out" rule turned on by default at World of Card Games. However, the option can be unchecked to play with the rule that the high score always wins. There's a fun Double Deck Pinochle tutorial at World of Card Games. You can also find Double Deck Pinochle tips at Pagat. You will find some animated discussions about Doule Deck Pinochle strategy at Power Pinochle.